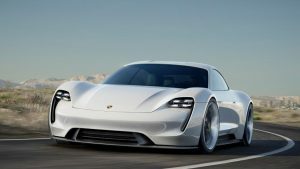 Electric Vehicles: The Why and Misconceptions. Will the automotive era come to an end in the 21th century? Looking at today’s environmental and economic challenges one could think so, as we might develop towards a modern society in which cars can be regarded as an old school status product, for which there is no use, no place, no money and no interest1. We don’t believe so. At Business Lease, we predict that mobility will move towards Autonomous, Electrified, Connected and Shared models. In this blog, we will investigate the electrification of mobility and why Business Lease welcomes this trend. Did you know, that around the 1900s, electric vehicles accounted for around a third of all road vehicles in the U.S.? With the introduction of the Model-T however, Internal Combustion Engines (ICE) took the definitive lead due to high driving range, affordability and low price of oil2. However, we are not living in the 1900s anymore. Nowadays, CO2 and NOx emissions are everywhere, oil prices are rising and resources will be running out in the future. With Electric Vehicles (EV), mobility is moving towards Neutral Emission Design and Neutral Energy Design. Tailpipe emission of EV’s are zero, which has an immediate positive effect on local air quality and livability. Depending on the energy source, CO2 emissions can be ultra low or even zero. In contrast to some popular opinions, even the worst case environmental impact, with an EV driven on electricity from hard coal, is better than the current ICE car3. Furthermore, this figure also shows that the total environmental impact (including all emissions and materials, y-axis) is four times lower when driving on renewable energy. With an ICE, only two-fifths of the energy content in the fuel is transferred to useful mechanical power. In practice, with variable speed and load and the engine, this is significantly less. The efficiency of an EV is much higher. An efficiency of 85% is feasible at all loads and speeds4. It becomes even more interesting when including the origin and transportation of the fuel and electricity. This total energy chain is called Well (energy) to Wheel (car). For fuel, transportation, refining and distribution takes a significant amount of energy. Electricity is generated from different energy sources and generally comes in a mix. The current development is that this mix gets more and more electricity from renewable sources (Hydropower plants, wind farms and solar parks do not need additional energy). This increases the Well to Wheel efficiency in the future. If one compares Well to Wheel efficiency, it becomes clear that even the worst case efficiency for an EV, with electricity from coal-fired utilities, is still better than the ICE5. More so, EV’s running on electricity from renewable energy, are on average three times more efficient than the car using the ICE6. You could now ask yourself, but battery chemicals are bad for the environment and can’t be recycled, and there isn’t enough lithium in the world to make all the new batteries? New battery models are now being developed which could offer significant improvements and make use of different resources (for example Solid-State batteries). Experts predict that by 2025, about three-quarters of spent EV batteries will be reused and then recycled to harvest raw materials7. Utilities plan to use batteries for energy storage once they are no longer viable in a vehicle. This will be further explained in the next blog as electric cars are more and more seen as storage capacity for the fluctuation of renewable energy as well as dive deeper in the issue of batteries. Has this gotten your attention? We are always thinking about the next steps in mobility at the Business Lease Innovation Lab. If you are interested in working together, or want to know more about the offerings we are developing, please contact Luuk. 1 Rieck, F., & Machielse, C. (2017, October). Automotive, the Future of Mobility. EVS30 Symposium. 3 Messagie, M., Boureima, F. S., Coosemans, T., Macharis, C., & Mierlo, J. V. (2014). 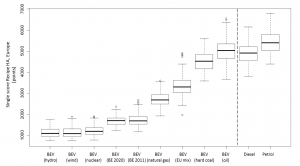 A range-based vehicle life cycle assessment incorporating variability in the environmental assessment of different vehicle technologies and fuels. Energies, 7(3), 1467-1482. 4 Rieck, F., & Machielse, C. (2017, October). Automotive, the Future of Mobility. EVS30 Symposium. 6 Righolt, H. C., & Rieck, F. G. (2013, November). Energy chain and efficiency in urban traffic for ICE and EV. In 2013 World Electric Vehicle Symposium and Exhibition (EVS27) (pp. 1-7). IEEE.